Jordan Leopold, second from left, broke a nearly three-month scoring drought as the Avalanche snapped a four-game losing skid with a key 2-0 victory over the Flames on Monday night. Just when it appeared the Colorado Avalanche were in a tailspin, they played as a cohesive unit and snapped a four-game losing streak. Jose Theodore stopped all 23 shots he faced, while Jordan Leopold scored for the first time in nearly three months as the Avs picked up a crucial 2-0 win over the Calgary Flames at the Pepsi Center on Monday night. With the victory, Colorado moved into a tie with the Vancouver Canucks for seventh place in the Western Conference. The Avs stayed three points ahead of Edmonton and went four up on Nashville in the ever-so-tight race to the Stanley Cup Playoffs. The loss prevented Calgary from moving ahead of first-place Minnesota in the Northwest Division. The Wild remain one point ahead of the Flames despite Monday’s 5-3 loss to the Oilers. Leopold took advantage of Peter Forsberg’s return when he took a pass from the latter and beat Miikka Kiprusoff on the power play 6:36 into the second period. It was his first goal since Jan. 5, a span of 28 games. The shutout was Theodore’s third of the season. He preserved it in the final minute, when the Flames were awarded a power play. 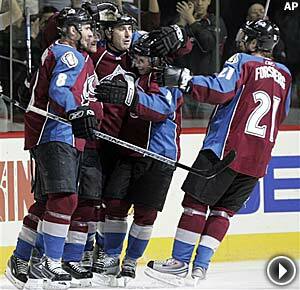 Colorado went up by a pair when Milan Hejduk scored with 7:41 remaining in the third period. Keenan replaced Kiprusoff with Curtis Joseph after the tally despite the fact that his starting goalie stopped 22 of 24 shots. They may be eliminated from postseason contention, but the Islanders aren’t about to roll over for anyone. Pittsburgh found that out the hard way on Monday night. Bill Guerin had a goal and an assist, and Wade Dubielewicz made 28 saves as the pesky Isles handed the Pens a disappointing loss at the Nassau Coliseum. Pittsburgh fell three points behind Montreal for the Eastern Conference lead, as the Habs beat the Ottawa Senators on Monday. To make matters worse, the Penguins had a chance to extend their Atlantic Division lead to four points over the New Jersey Devils. Instead, first place will be on the line when the teams collide on Tuesday night at the Prudential Center. The Islanders snapped a five-game losing streak at the Coliseum with the victory. Richard Park scored shorthanded, while Sean Bergenheim and Trent Hunter also beat Pens goalie Ty Conklin, who was left out to dry on several occasions. ''We obviously weren't on our best game,'' Pittsburgh forward Jordan Staal said. ''We just came out flat. We were a little sloppy. There is no excuse for it. We should've been ready for this game, and we weren't. The Islanders began to pull away in the second period, when they scored twice and outshot the Penguins by a margin of 14-3. Guerin gave New York a 2-1 lead with 8:15 left in the second, while Bergenheim put the Isles up by two when he put Guerin’s rebound past Conklin just over three minutes later. Andrew Cogliano netted a pair of goals as the surging Edmonton Oilers continued their playoff push with a 5-3 victory over the Minnesota Wild. Craig MacTavish’s crew isn’t about to concede anything. While Edmonton remained three points out of a playoff spot despite Monday’s win over Minnesota, the Oilers are prepared to do everything in their power to make it a fight to the finish. Andrew Cogliano once again played a key role for Edmonton, as he scored a pair of goals in what was the Oilers’ sixth win in seven games. While Edmonton failed to gain ground on Colorado, it did move past the idle Nashville Predators into ninth place in the Western Conference. "The bottom line is that it could be anybody that falls," MacTavish said. "These are tough games. If somebody goes on a stretch in the last five games where they only win a game, then even the top teams are vulnerable. It's unlikely, but this whole thing has smacked of unlikely-ness right from the outset. Something strange is going to happen." The loss was the third in four games for the Wild, who remained atop the Northwest Division thanks to Calgary’s loss to Colorado. Nick Schultz, Sean Hill and Todd Fedoruk scored for struggling Minnesota. "It didn't look good, eh?" Wild coach Jacques Lemaire said. "It didn't look good from behind the bench, either. We were not ready to play. Period. Not ready to play. We played a little bit in the third because some of the guys were upset and they had to do something. We probably had the record for turning the puck over tonight. I didn't count it, but we probably had the record." It didn’t look good from the get-go for the Wild, as Edmonton jumped out to a 3-0 lead after firing only four shots on goal. Curtis Glencross, Cogliano and Dustin Penner all beat Nicklas Backstrom in the first 5:02 of the contest. "It was another real solid game," said Oilers defenseman Steve Staios. "We just keep going. We have to be really happy with that effort. That was a really good team that we played today. We got some goals early and took away their momentum." Schultz gave Minnesota some life just 39 seconds after Penner scored to cut the lead to 3-1, but Edmonton restored the three-goal lead at 3:54 of the second on Kyle Brodziak’s 14th goal of the season following a failed clearing attempt by backup goalie Josh Harding. Hill scored less than two minutes later, but Cogliano tallied his second goal of the night 8:59 into the period. It was his 18th goal of the season. "We have a lot of young guys and they are playing unbelievable,” said Oilers goalie Dwayne Roloson, who made 31 saves. “They are playing like veterans. It's a breath of fresh air when we come in here and they are all excited."